Despite all the great new shows that keep coming up, we've still been trying to find time to keep up with our efforts to complete older shows like Breaking Bad. And as demanding as a busy gaming and theater schedule can be, we're stil moving forward from time to time. We're trying not to rush through the show as it's an experience that is better savored and relished. But this review marks our crossin the halfway mark for this show and the inevitable path towards the end of this interesting narrative journey. But lets not get ahead of ourselve - there's still plenty of story left and the writers really did a number on how they crafted this experience. And thus far my partner Tobie and I have been enjoying every bit of it. As with a lot of good stories of this nature, it's great how things keep taking a turn for the worse whenever it seems things are going well. 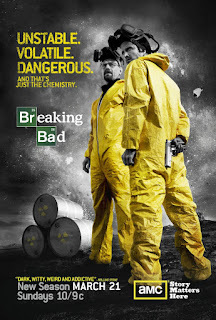 Synopsis: Breaking Bad is an American crime drama series created by Vince Gilligan. The third season marked characters Saul (Bob Odenkirk), Gus (Giancalo Esposito), and Mike (Jonathan Banks) becoming series regulars. The last season ended rather dramatically with the odd mid-air collision of two small planes. Debris has landed all around the city and Walter (Bryan Cranston) remains at home alone as his wife Skyler (Anna Gunn) has moved out together with their son (RJ Mitte) and their newborn daughter. The possibility of divorce finally leads to Walt coming clean to her about how he has been making money to support both the family and his cancer treatment. On the flip side Jessie Pinkman (Aaron Paul) is in rehab trying to get clean and to get over the death of his girlfriend Jane (Krysten Ritter). Her death led to her father being in the distraught mental state that helped lead to the plane accident as he was worked as an air traffic controller - a weight that Jessie also bears. Meanwhile Gus is dealing with Walter not wanting to "cook" drugs anymore. At the same time he's trying to hold the Mexican cartels at bay as he still sees value in working with Walter. 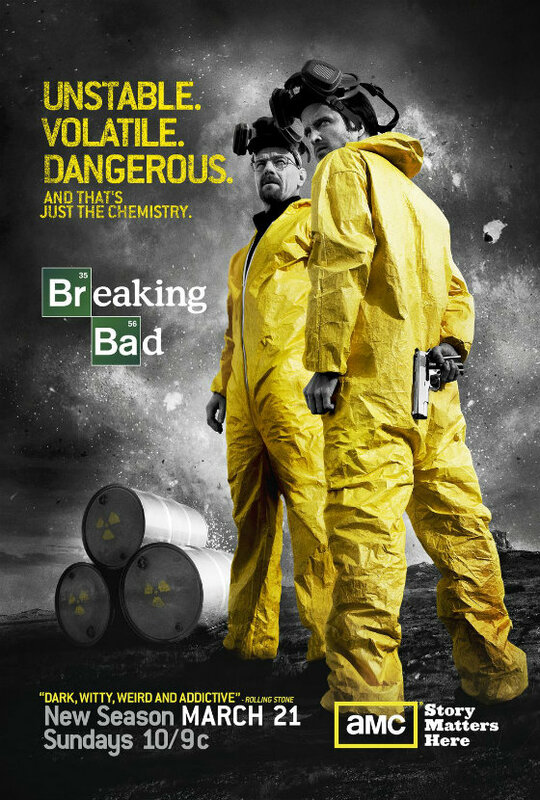 What I Liked: I enjoyed the beginning of this season that once again has Walt and Jessie growing as characters independent of one another. Sure we love them working as a team but they still shine in their own right as individual. And the emotional situation of the last season really called for more growth apart before getting back together (which we all know to be inevitable). Things elevate to a new level after Walt finally takes up Gus's offer to cook his drugs directly at a facility Gus has put up for him. Gone are the days of him making do with limited resources and the confines of the old RV. Instead he has a fully stocked lab and even an assistant whose knowledge of chemistry compliments his own. It certainly sets the stage for Walter to reach new highs of nerd science criminality. What Could Have Been Better: A long-running arc in the story involves two Mexican hit men who cross the border to seek revenge revenge on Walt for the death of Tuco in the prior season. While their presence in the show was rather ominous, the build-up quickly became rather tedious as we had them on what can only be described as a C or D story track tha stands only a little higher than a post credits scene. How this eventually resolved made for a striking moment but not necessarily a fulfilling narrative arc. Skyler's character arc is also a rather odd one that is hard to get a good read on. You want to feel bad for her given everything that Walt has done but then there's also the reality that she ends up making some really weird decisions on her side. Walt Jr. continues to be so much window dressing at times and hopefully this will all lead to somewhere meaningful for Walt's family in the long run. TL;DR: Breaking Bad continues to fascinate in its third season and manages to find a way to elevate things to a level of its own. There's some pretty serious character development for the main characters and some great narrative twsits for them as well but for few others. The season still gets a full 5 grandiose cooking plans in the new lab out of 5.